This is Part 2 of a two part series on the production of 2018S2 GPK Oh the Horror-ible. If you missed Part 1 you can go here to catch up. 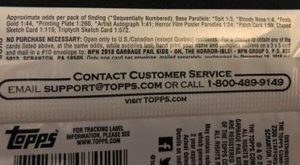 In the first post we looked at how many packs/boxes/cases were produced of 2018S2 Garbage Pail Kids Oh the Horror-ible. Here’s a review of what we came up with. Still there are some things we just can’t determine. Topps has made it tough on us in recent releases. They no longer share a lot of information on the sell sheets for insertion numbers. This means we can not figure out each different retail pack type. Therefore, there are many retail items that we are unable to determine the production on. For example, the Yellow Phlegm borders. Since there is no way to break out the number of gravity feed packs from the other retail packs, we can not determine how many Phlegm borders were made. Same scenario applies to the new Jelly Purple parallels. This also true for the various retail bonus sets; Classic Monsters (Fat Pack Insert Set), Trick or Treat (Hobby/Retail Insert Set) and Bathroom Buddies (Blasters). Production is slightly up, and Topps increased the Blaster and Fat Packs to make up for the removal of Gravity Feeds. This means the number of yellows out there could be different than previous releases. The lack of retail breakdown also means we can not determine how many Loaded Sketches or Panoramic Sketches were inserted into packs. While we can’t figure out the Yellow Phlegm or Purple Jelly parallels, we can determine how many of the other two non-numbered parallels were made. We can also find out how many of the Horror Film Poster bonus inserts were made. Bruised Borders – 60,000 Collector packs X 1 Odds (doh) = 60,000 total Bruised borders / 200 cards in set = 300 per card. Puke Borders – 380,000 Retail packs X 1 Odds (doh) = 380,000 total Puke borders / 200 cards in set = 1900 per card. Horror Film Poster – 60,000 Collector packs / 24 Odds = 2500 total cards / 10 in set = 250 of each card made. How do these numbers compare to the previous set, We Hate the 80’s? With the sharpe increase in Collector boxes, the number of Bruised parallels and Horror Film Posters increased. Likewise, with a slight decrease in retail production, the number of green cards is also down slightly, although at 1900 is still quite a bit. One thing I always find interesting is to determine what pack types the printing plates and artist autographs are hiding? Retail always has the majority of the plates because over 80% of the production is retail, but does that hold true for this release? We know Topps inserted 400 plates and 2,500 autos into production so here is the breakdown of how many can be found in each pack type. Wait what? There is a lot that doesn’t make sense with these numbers. Here is a big sticking point in the production numbers. We are going to have to make some serious educated guesses here to make sense of things. Let’s start with the auto numbers. First my methodology. I used 103 as the odds for retail, which is roughly what Hobby/Retail and Blasters are. Remember Fat Packs is basically a double pack, with the odds being 1:42 for autos it still doesn’t quite work out evenly, but it wouldn’t throw the numbers off as much as you see here. Based on the odds, there were over 5,000 autos inserted into packs. We know this isn’t the case because they are numbered /25, so there are a total of 2,500 autos. So why do the odds show double? I think the odds on a lot of the hits are just wrong. Logically looking at the numbers, in order to get down to the 2,500 autos we would have to halve the number of packs produced if the odds were correct. There is no way production was cut in 1/2 for this release. Therefore, the odds must be higher than stated. Here’s another way to look at it. I personally broke a number of cases of each product type. Based on the auto odds I should have received just about 2 autos per retail case, and almost 5 autos per Collector case. That just isn’t what I pulled. Retail cases I got 1 auto in every case, while one case had none. Likewise, with Collector cases I averaged 3 autos not the 4-5 I should have. Therefore, I believe the odds to be incorrect for autos on all pack types. For retail pack types they should probably be doubled. while Collector packs should also be slightly higher. How about plates? There are a couple of very interesting things to point out. Again I believe the odds are off, albeit slightly. Based on the odds we came up with over 500 plates in the product. That’s not possible because we know only 400 plates were inserted. While the numbers aren’t off as much as autos, they are still off. The other huge change from previous sets is the number of plates found in Collector packs. Odds for Collector packs are a lot easier than the previous set. Before if you wanted a plate, you had to look at retail. With Oh the Horror-ible that isn’t the case. Collectors trying for a plate should bust Collector cases. Shaped Sketches – 60,000 Collector packs / 115 odds = 521 Shaped Sketches in Collector packs. Triptych Sketches – 60,000 Collector packs / 572 odds = 104 Triptych Sketches in Collector packs. Sketch odds are very similar to the We Hate the 80’s set. That makes sense as production was only slightly up overall. However with production up on Collector boxes the odds are a bit harder than usual. One thing to note about the numbers. The Shaped sketch total for one is higher than it should be. I believe the odds are a little harder than stated. 58 artists were asked to each complete 6 shaped sketches, thats only 348 shaped sketches. We know some probably didn’t get completed or were rejected by Topps. But once again Topps seems to be off on the sketch odds here. Triptych odds however, appear to be close. While production was only slightly up, this set saw huge changes in production for Topps. Oh the Horror-ible saw the removal of gravity feed boxes, which dramatically changed how many other types of retail packs were produced. Also, strong collector demand brought huge increases to Collector boxes. With only 4 months until the next retail set, We Hate the 90’s, it will be very interesting to see how production is altered. Will the same collector demand be there for We Hate the 90’s, or will Collector production drop down to previous levels? Will the continued absence of Gravity feed boxes affect how will distributors order retail? With GPK at maybe its most popular since the 30th anniversary set, will the momentum continue? It will be fascinating to see the numbers come January for We Hate the 90’s. Base Cards – (60,000 Collector packs X 6 cards per pack) + (380,000 Retail/Hobby packs X 7 cards per pack) = 3,020,000 Total Base Cards produced / 200 cards per set = 15,100 Total of each base card. Of course with a larger set of 200 cards, that means there are less base sets possible with Oh the Horror-ible. 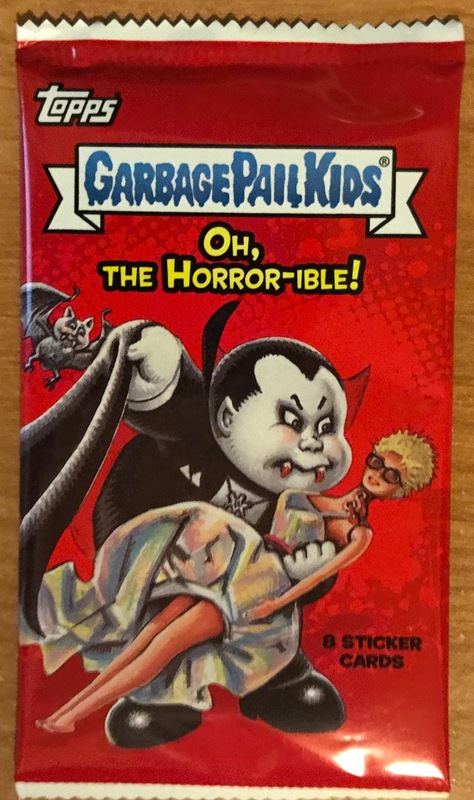 Don’t delay, go get some packs of Oh the Horror-ible, buy some popcorn, and pop in a DVD of your favorite horror flick….The Garbage Pail Kids Movie! This is Part 2 of a two part series on the production of 2018S2 GPK Oh the Horrorible. If you missed Part 1 you can go here to catch up. This entry was posted in 2018 Horror, Odds and tagged 2018 Horror, Odds by Jeff. Bookmark the permalink.